I am a doodler. I first came to this realization in Second Grade when I drew little trails behind the sentences on the back of my spelling notebook. They made sense to me: the trails followed the contours of the words. The words were obstacles that the hiker had to go around. The trails were exciting new areas of exploration. I got in trouble. Apparently, you aren’t supposed to draw trails on the back of your spelling notebook. The problem is: you have to sit still in class, in a lecture, at church, during a training session at work, and in college lecture halls. You are supposed to take notes. I take copious notes and my notes make a lot of sense. But in between those words are gaps: pauses in the speaker’s thoughts, reiterations of a point already made (how many times can you underline it to emphasize it? ), and unimportant digressions in the dialogue. I have a pen in my hand. Snow cap mountains flow out of the ink. Prancing chargers, wild mustangs, howling coyotes. One line to depict the mountains is never enough: you have to shade them in to show the timberline or the snow line. 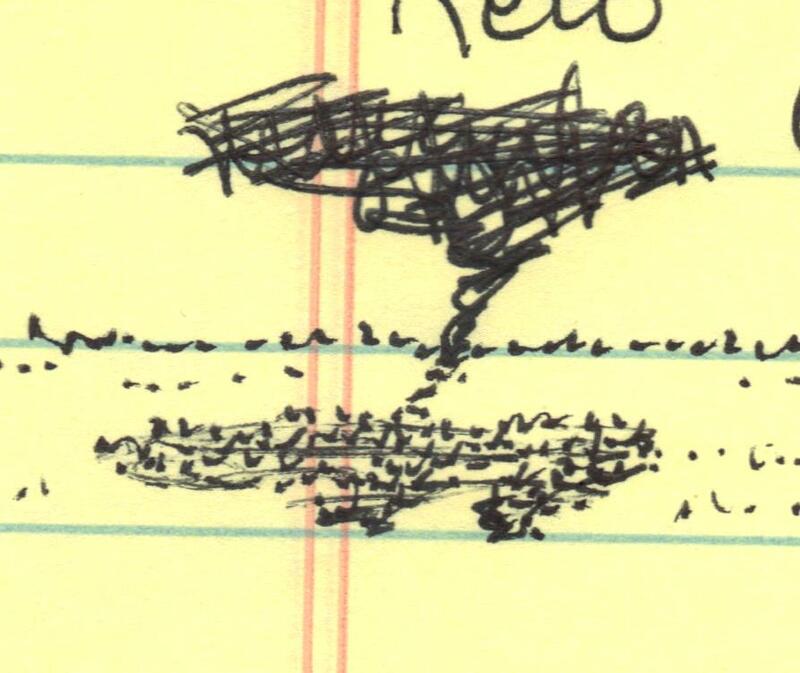 A simple tree takes care of a note you need to erase. But a tree needs a shadow and there needs to be grass around the tree. The sun rises over the waves and reflects in choppy sentences. I really am paying attention. I probably am gaining more out of the lecture than the person sitting next to me who is taking no notes at all, or the person who is so intent on the speaker that they’re not hearing the words. An emphasized statement can only be underlined and highlighted and marked with exclamation points so many time. Eventually, flowers have to grow. A dahlia takes over the O. Just “google” this: THE ART OF DOODLING. It will blow your mind. I am not alone in this nervous habit of having ink in my hand and needing to spread it out onto the paper in pictures. My father once espoused that he thought ancient pictographs and cave paintings were simply doodles. He said it to get a reaction from his favorite role model, his Uncle Frank (and he did get the desired response. Great Uncle Frank was an archeologist at heart and he nearly had apoplexy at my dad’s suggestion). But I don’t think Dad was entirely kidding: I think sometimes the art was there just for art’s sake. The ancient people painted and scribbled for the same reasons we do: nervous habit, a desire to create, and to tell a story here and there. This story is one inch by one and a quarter inches. 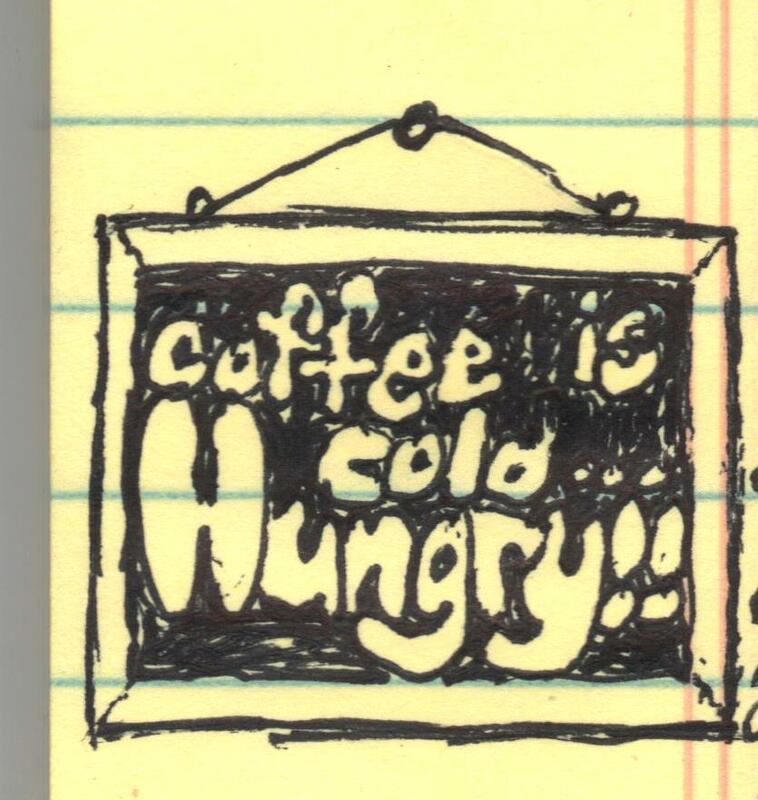 My coffee was cold and it was bearing down on lunch time. I hung it on a plaque on my notepad. And then there are the webinars that go on forever. The entire top portion of my 8×11.5″ yellow tablet becomes a story in between the note taking. Mountains rise, storms come, rainbows become visible as the sun comes out, flowers grow, frogs hide in the cattails, and a pot of gold is found in the bed of four-leaf clovers at the end of the rainbow. 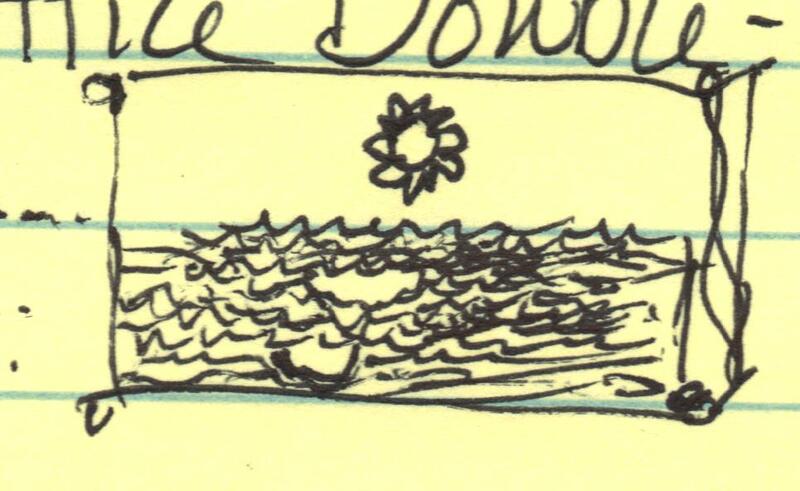 Those were doodles over two days’ of heavy note taking on a new accounting system. The doodles keep my head from hurting with all that information. such a cute little doodlebug!